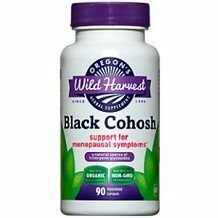 This review is for a product called Black Cohosh Support for Menopausal Symptoms. This product offers the consumer support with the uncomfortable symptoms that are often associated with going through the big change that is menopause. These symptoms include hot flashes, sweating, irritability, mood swings, decreased libido, and insomnia. Women who go through menopause also state that they notice a significant decrease in their cognitive functioning as well as their ability to concentrate. 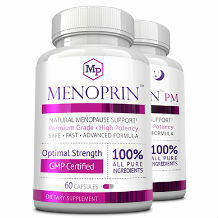 The manufacturers of this product claim that use of this dietary supplement cannot only reduce symptoms of menopause but it may also be beneficial to women who are premenopausal. Black Cohosh Root is effective when used to treat menopause symptoms in women due to it being a natural source of triterpene glycosides. We are skeptical that this short list of ingredients can adequately address all of the varied symptoms associated with menopause including hot flashes, sleep issues, irregular periods, and more. Take one, or two capsules daily with a meal. The manufacturer does not state the best time of day to take the supplement nor who should take one capsule or two capsules. Consult with your doctor before using this supplement as well as after having taken it for six consecutive months. Do not use if you are using a contraceptive or hormone replacement therapy. An additional warning from the manufacturer states that you should not use this herbal supplement if you suffer from an estrogen-dependent breast cancer. For use by adult women only. Do not use if pregnant or nursing. You can purchase this supplement directly from the manufacturer’s website for $16.95. This is for a 90 capsule count bottle that should last about six weeks. Shipping is free, but only if you spend over $50. There are no bulk buying discounts nor new customer incentives offered by the manufacturer. There is no manufacturer’s guarantee nor return policy for this product. The lack of a guarantee shows a lack of confidence from the perspective of the manufacturer. There were several aspects of Black Cohosh Support for Menopausal Symptoms that we found encouraging. The supplement is non GMO, certified organic, and vegetarian. We also liked that it is free from excipients, stearates, and binders. It does not contain dairy, wheat, gluten, peanuts, soy, or corn allergens. Also there is no animal testing or by-products, artificial flavors or colors. Regarding the price, this supplement is good value for money at $16.95 for a six weeks’ supply. We also liked that there is free shipping when spending over $50. We do have some less positive comments however. The manufacturer does not state the best time of day to take the supplement nor who should take one capsule, or two capsules. There are no bulk buying discounts, nor new customer incentives offered by the manufacturer. The lack of a guarantee, or return policy is very disappointing. We were concerned by the number of warnings that the manufacturer included with this supplement. Lastly, we had a hard time finding a good selection of reviews for this supplement. Our recommendation is that you look elsewhere for a product that is backed by a strong return policy and guarantee and one that has a bulk buying discount.